Mother’s Day already? Yep, Mother’s day is on Sunday, May 11 – Just 2 weeks away. If you need help figuring out how to plan a great Mother’s day, we’re ready to help you out. Our trick: Start the day right! If your mom is anything like mine, she taught you that breakfast is the most important meal of the day. 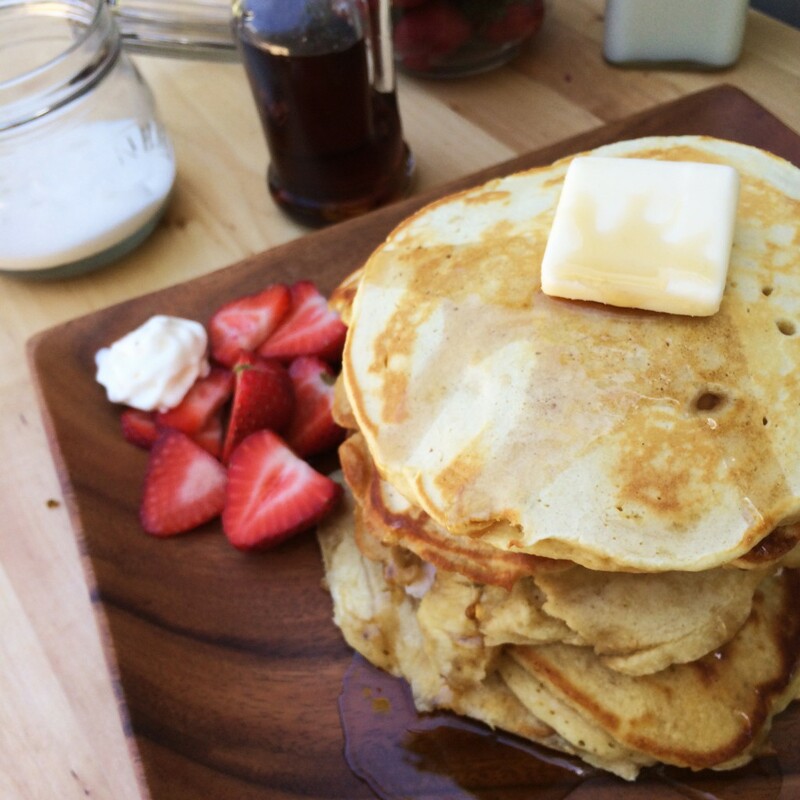 So help your mom start her day off right with a stunning, easy to make breakfast: homemade pancakes, made with love. We’ve even put together a pancake breakfast kit so you can make mom’s breakfast as beautiful as it is tasty. So let’s get cooking. Whether you’re an experienced cook or just learning how to make pancakes from scratch, this buttermilk pancakes recipe is as simple as it is delicious. As is, it’s the perfect basic pancake recipe, and with a few tweaks (see suggestions at the end of the recipe) it can become a unique, unexpected, highly delicious breakfast experience. 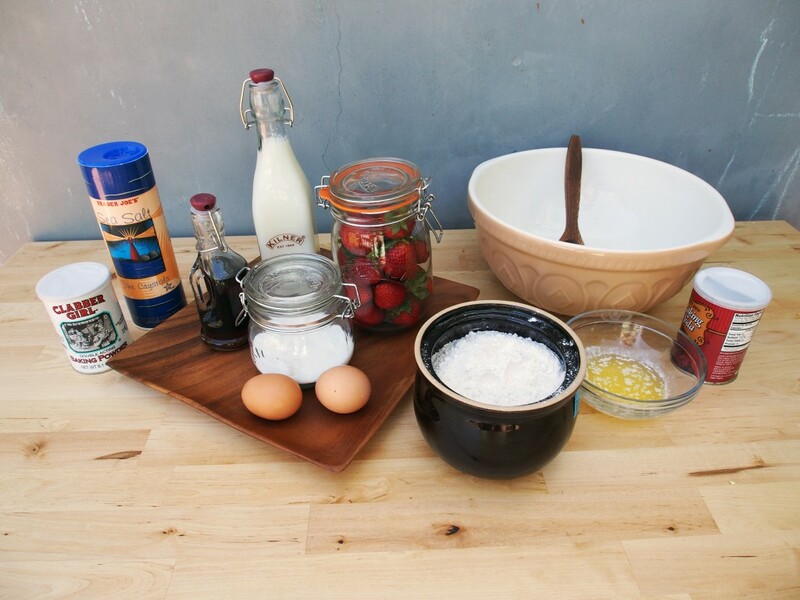 Get ready for an easy pancake recipe. Very few ingredients, very simple process, great results. It may seem like a lot of steps, but trust me. each step is easy! In a large bowl, like the Counter Grip Bowl from our Pancake Breakfast Set, whisk together the flour, sugar, baking powder, baking soda and salt until thoroughly combined. 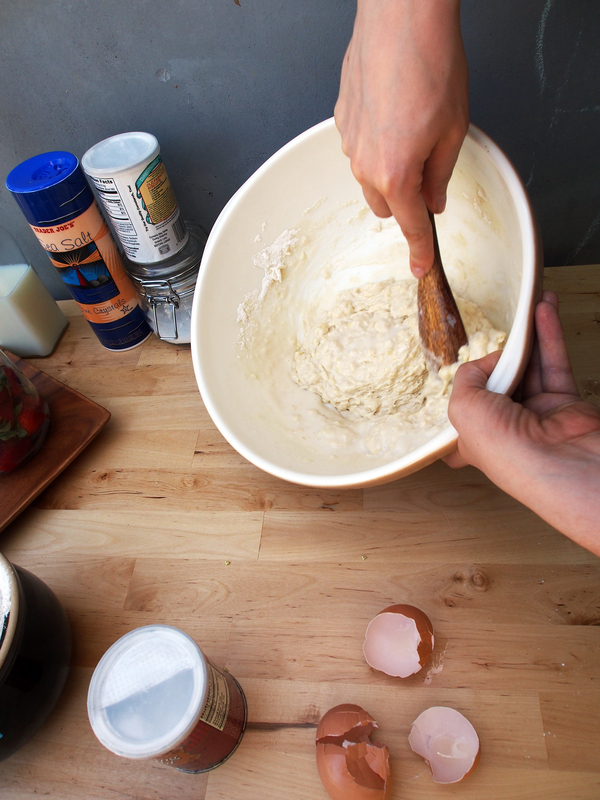 Make a well in the center of the dry ingredients and add the buttermilk and eggs. Whisk to combine. Add the butter and whisk, or stir until just combined. Some lumps are good – DON’T whisk til smooth. If it seems too thick (like mine above) add more buttermilk. Heat an electric griddle to 375 or a pan to medium high heat. When skillet or griddle is hot, add butter. Let it melt and bubble. Add a drop of pancake batter to the pan. If it sizzles, it’s hot enough. Using a ladle, pour pancake batter into the pan. You can make your pancakes as big or small as you want, but I find that 5″ – 6″ diameter pancakes both cook evenly and are easy to flip. Leave the pancakes alone for 1-2 minutes. Seriously, don’t mess with them. When to flip pancakes: Flip the pancakes when they appear set around the edges and bubbles are rising to the surface throughout. How to flip pancakes: Grease your spatula. Wiggling it a little, slide it under the pancake all the way. Lift and turn over quickly. Let cook another 2-3 minutes, then remove from heat. Serve immediately, drizzled with maple syrup or keep warm in the oven. No one likes cold pancakes. We suggest a stack of 2-3 pancakes per person, served with a side of sliced fruit. * About the optional ingredients: Consider amping up the flavor of your pancakes to make them extra special for mom. Play with flavor combinations and think about what your mom likes. My mom’s favorite pancakes have orange zest and nutmeg in them. Vanilla and lemon zest is also great as is cinnamon and almond extract. With any herbs, spices, extract or zest, add them to the pancake batter with your liquid ingredients. I like letting my citrus zest sit in my melted butter. I think it gives a stronger flavor. For bigger add-ins like blueberries, fresh bananas or chocolate chips, add them in when the first side of the pancakes are almost set – RIGHT before the flip. There you have it. 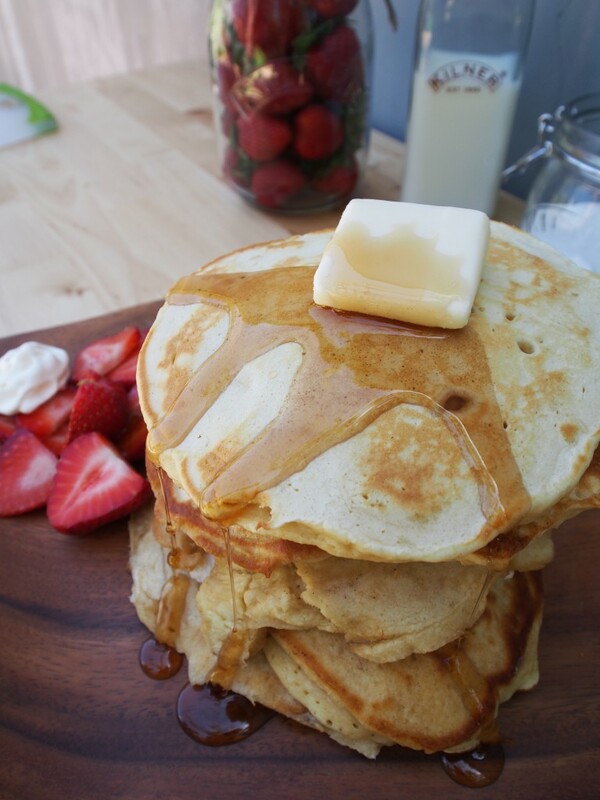 Delicious pancakes that are perfect way to kick off a beautiful Mother’s Day. This recipe is literally the best pancake recipe. It is adaptable if you want to make blueberry pancakes from scratch, great for chocolate chip pancakes, and super-easy. If you plan it right, these pancakes are the perfect breakfast in bed entree: Easy to cut and eat with a fork, comforting, and delicious. Sure, you run the risk of getting syrup on the sheets, but if mom loves breakfast in bed, it’s totally worth it. 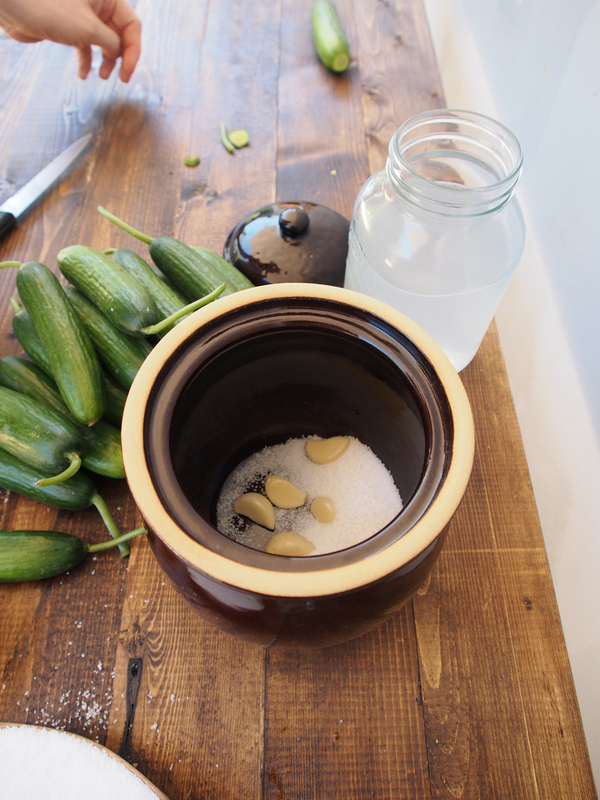 How to Make Pickles: A Tutorial on How To Pickle Like a Pro! Cucumbers are growing like weeds around here, and our local markets are selling them cheap. 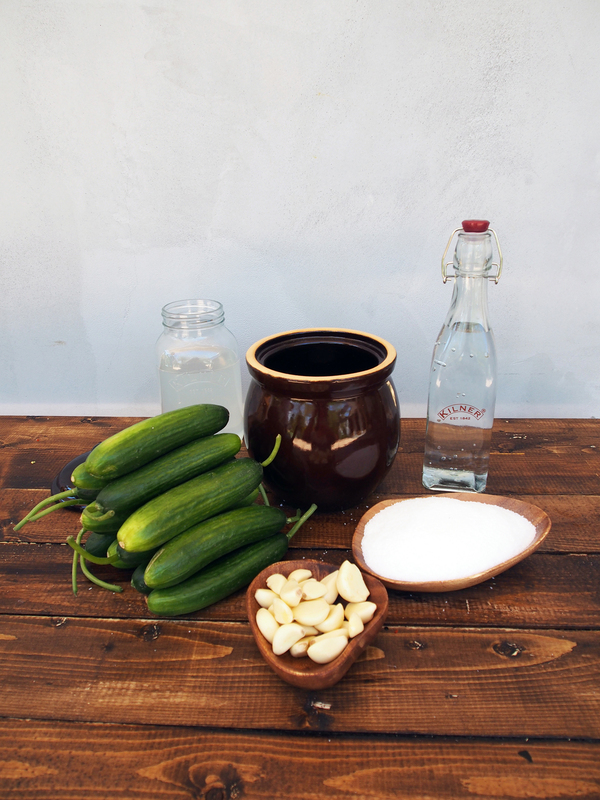 We stocked up on cucumbers just so we could teach you how to pickle them and how to make homemade pickles! We’re nice like that. 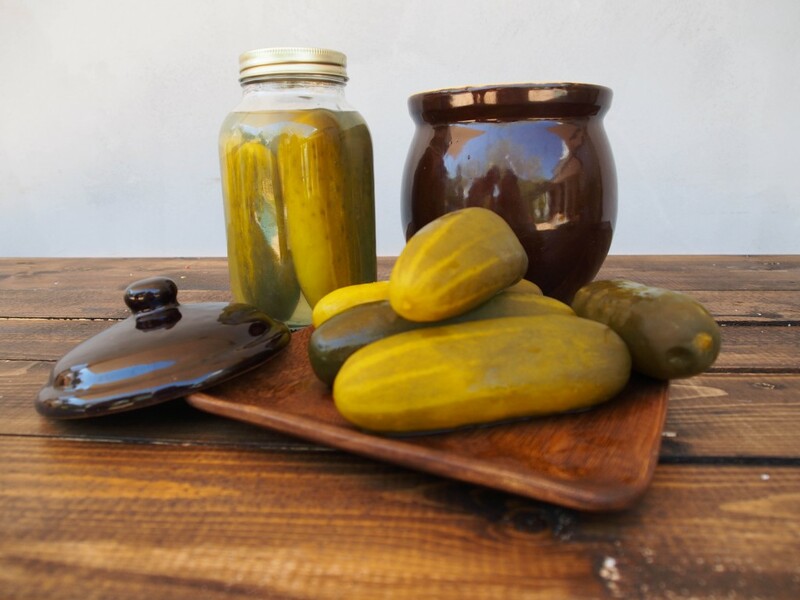 This recipe for pickles is an old-fashioned fermented pickle recipe. These delicious pickles take about 10 days to 3 weeks to ferment. If you start now you’ll be enjoying tangy, crunchy pickles before May! Since they’re the perfect side for burgers at summer barbecues, we suggest making a bunch and canning them so you and your guests can enjoy homemade pickles all summer long. We’ve even put together an awesome DIY Pickle Starter Kit if you want to have everything you need in one place! Ready? Let’s ferment! 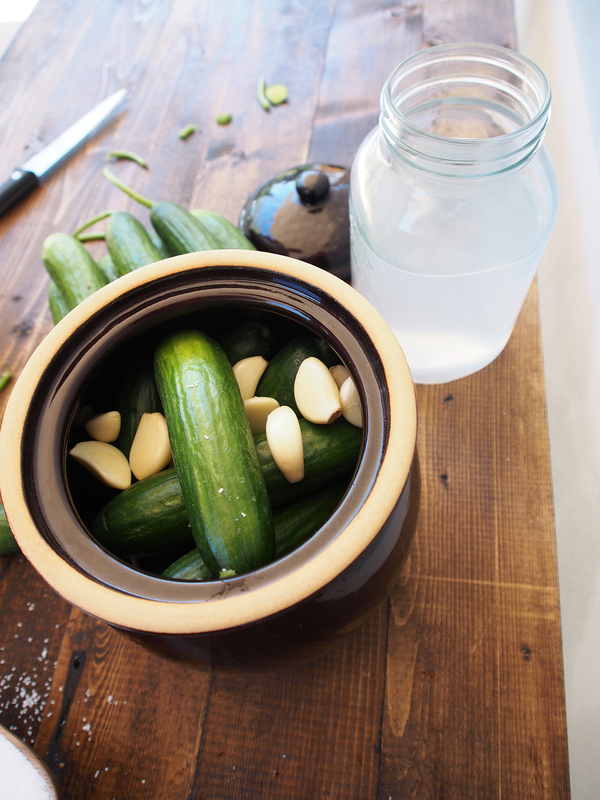 It’s more appetizing than it sounds and is the simplest way to learn how to make pickles. Ingredients. 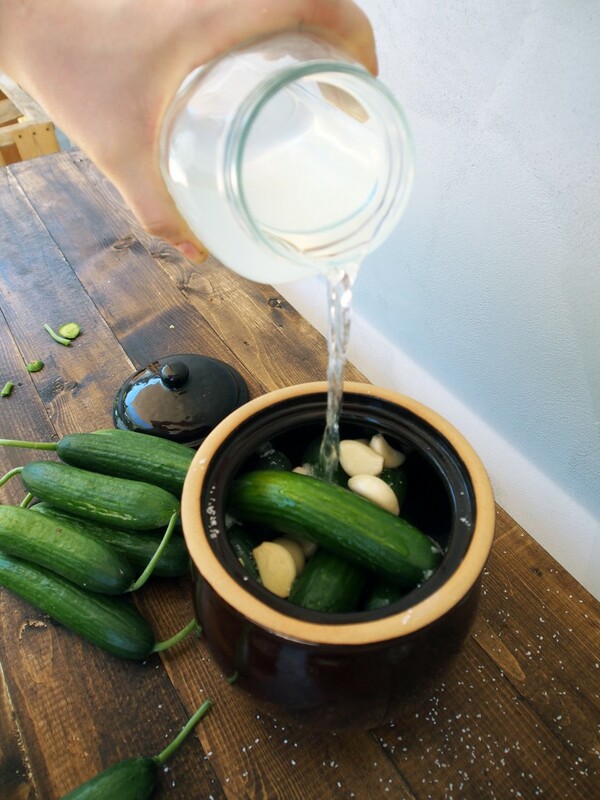 – As you’ll see above, it doesn’t take many ingredients to make great pickles. I keep mine pretty simple. This recipe doubles, triples, or even quadruples nicely. 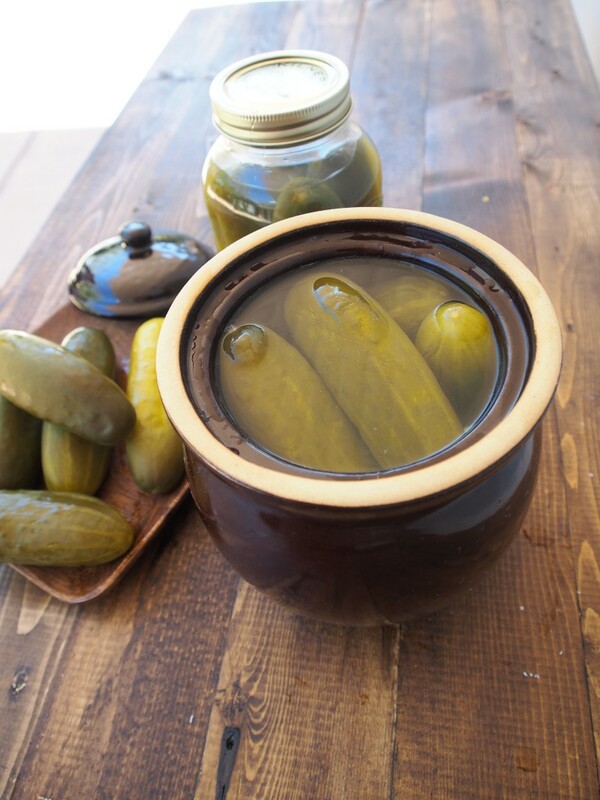 Pickle pot (I use a 2 liter pickle pot for above recipe – everything BARELY fits) or fermenting crock. 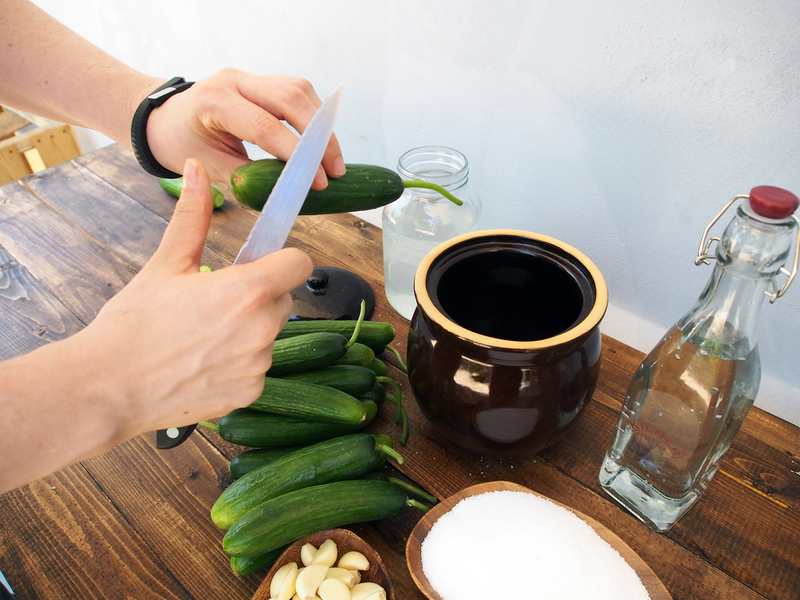 If you’re using the crock in our Pickling Starter Kit, double the recipe above! Once you’ve gathered your equipment, begin by prepping the cucumbers. To do this, make sure they’re still crisp with no soft spots. Scrub them well, then slice off the blossom end of each cucumber, like you see me doing above. If you’re not sure, it’s the end opposite the stem. You can leave the stem, just snip off a tiny bit of that blossom end. It helps the pickles stay crisp. Next, throw some of your salt, any spices you’re using, and about half of the garlic in a clean pickle pot or fermenting crock. You’ll notice I’m using one of our storage crocks in this picture – I wanted to see if it was as good for pickling as it is for storage. And, if you’re wondering, it totally worked! Once that’s taken care of, add in your cucumbers. Literally, cram as many as you can fit right on in there. You’ll still have room for the brine and stuff. While you’re at it, add the rest of the garlic as well. Also, if you’re adding dill (that’s how to make dill pickles, folks,) add it now. Once you’ve got all of that in there, it’s time to add the components of the brine: White vinegar and water (or, if you’ve got it, leftover pickle brine and water.) Either works. Once you’ve added all that brine (I told you there was room,) make sure the cucumbers are covered completely (add more water if they aren’t) and pop a lid on the crock. 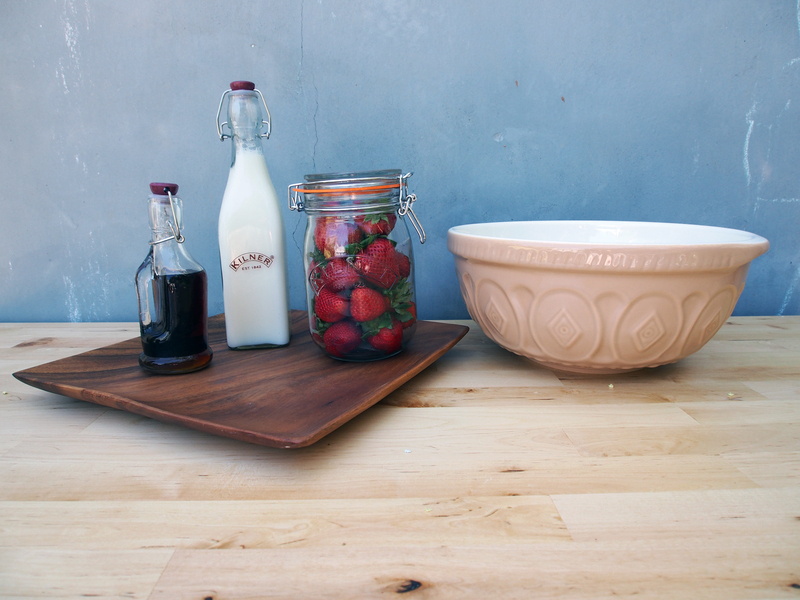 If you’re using one of our open crocks, cover with a piece of cheesecloth or a muslin square, then top off with a plate to keep it airtight. You’re done for now. Seriously, that easy. Put the whole thing in a place where the temperature is between 70 and 75 degrees and leave it alone. Every day or two, give it a peek. Skim any mold off the top of the brine (it’ll happen and it’s no big deal) and check that the pickles don’t feel mushy or slimy. After about 10 days, start checking them for done-ness (they should look translucent all the way through. Cut one open. Taste it. Your homemade pickles are done when you’re happy with them. Once your pickles taste to your liking, keep whatever you want to eat right away in your fridge. If you made a big batch, or if you want to save them for later in the season/give them as gifts, it’s the perfect time to can them. 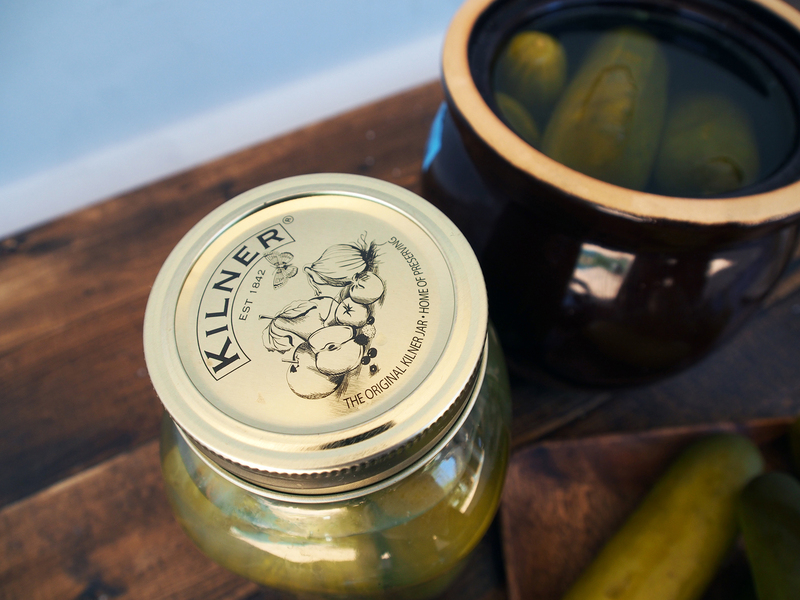 Just pack the pickles into Kilner jars (our 1 liter jars fit pickles beautifully.) Top them off with the brine. Pop the seals on the jars, then tighten down the rings until almost tight. Bring a big pot of water to a boil and process the jars in boiling water for 20 minutes. Let ’em cool, check the seals, and BOOM, you’ve got perfectly canned pickles that’ll keep at room temperature for 6 months. Not that they’ll last that long. Boom! Now you know how to make pickles. As we were photographing our brand new, spring gift sets for our blog, we realized that our Cinco de Mayo gift set was the perfect excuse to whip up some margaritas no matter what the date. And as we sipped our margaritas in the afternoon sun (we were shooting outside) we realized – we just HAD to share our recipe for you! It’s the perfect drink for a warm spring evening. Now, I have serious love for a classic, all lime margarita, but if you’ve been to the store lately (or if you listen to NPR) you know that limes recently got EXPENSIVE! So, to help make my dollar go further, I came up with a truly sensational lemon-lime margarita recipe. It still tastes like spring and sunshine in a glass, but if you’re throwing a cocktail party, you won’t spend your whole budget on limes. Plus, this recipe has 2 easy variations, a classic margarita recipe, and a spicy margarita variation. With just a couple of simple ingredients, you’re getting cocktail recipes for the work of 1! 4 half Liter Kilner preserve jars. I love that the threaded rims hold onto the salt on the edges really well. 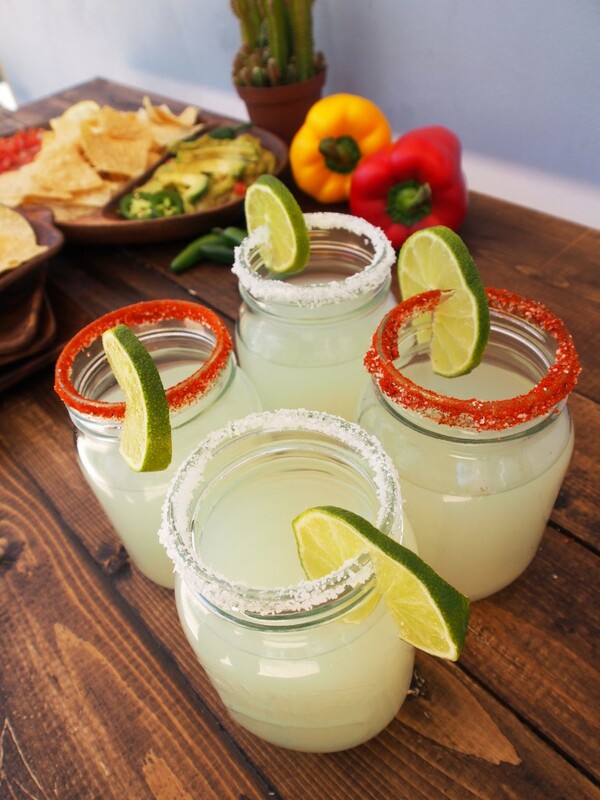 Figure out how many of your guests want spicy margaritas and how many want mild. Pour salt into your shallow bowl. Using a slice of lemon or lime, moisten the edge of your Kilner jar drinking glasses. Dip the moistened rims of the glasses for the non-spicy margaritas in salt. Tap once and flip over. Now, add cayenne pepper to your salt. I do about a 50/50 mix. Moisten the edges of the glasses for your spicy margarita drinkers. Dip glasses in the cayenne/salt mixture. Tap once and flip right side up. 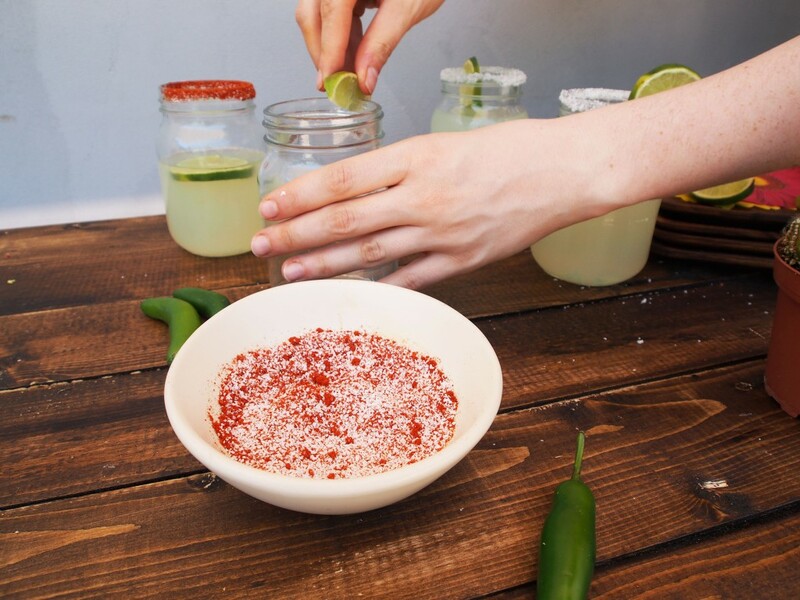 Add a healthy pinch of salt/cayenne mixture and a slice of fresh jalapeno to the spicy glasses. In a pitcher, combine the tequila, lemon juice, lime juice and triple sec. 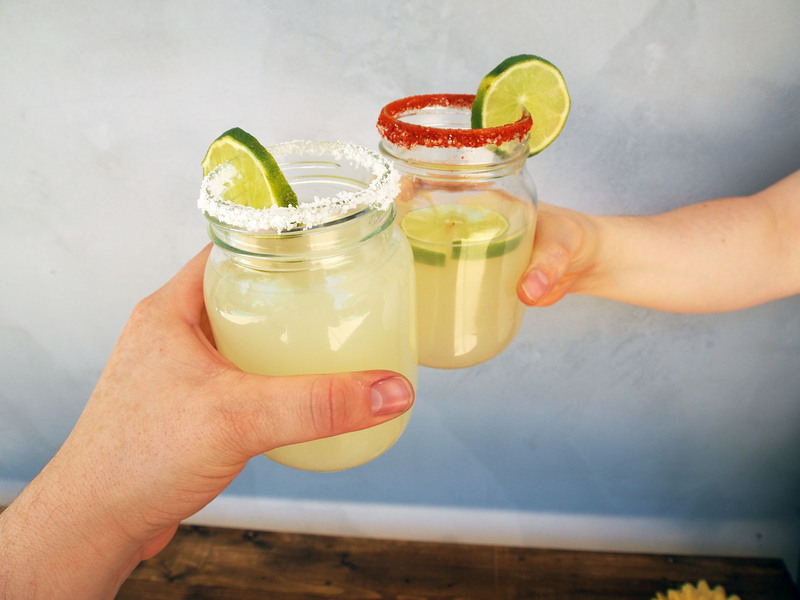 Put some ice cubes in each glass and pour your Margarita mix in carefully, so you don’t mess up those pretty salted rims. Drink and enjoy!! Add some chips and guacamole and some great music and you’ve got yourself a party!! 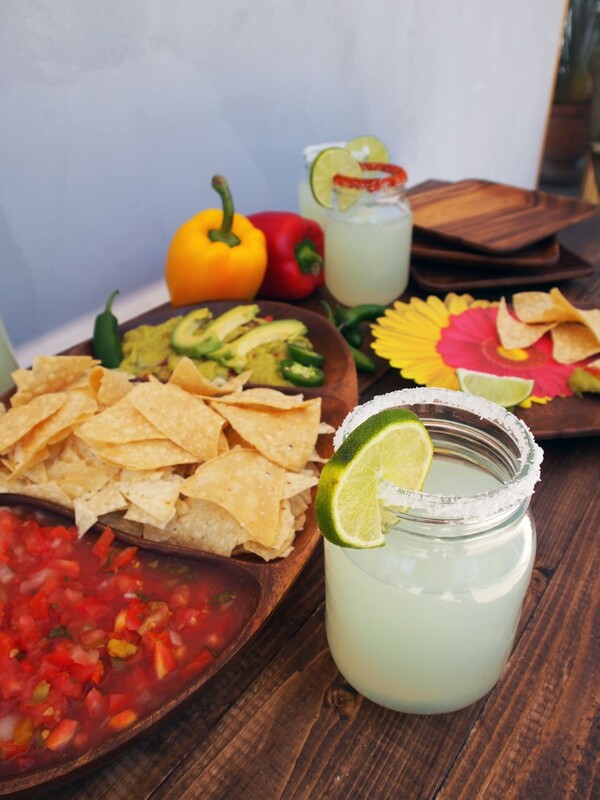 If you want to turn your perfect springtime margarita into a full-blown fiesta, we suggest some brightly colored decorations, a stunning chip and dip tray for those chips and guacamole, and some lively placemats, just to brighten things up. If you want all the guesswork taken out, consider our Cinco De Mayo Cocktail party set and a coordinating set of 4 Laguna Placemats. The Cinco De Mayo set includes a 3-sectioned tray that’s perfect for chips and dip, 4 plates, a set of brightly colored Deco Leaves© (just for fun!) and 4 Kilner drinking glasses – perfect for that margarita cocktail recipe! The placemats (check out that awesome GIF below!) come separately. We’ve got SO many colors available! Let us know what your favorite cocktails are in the comments, or share pictures with our page on Facebook or Instagram with the hashtag #PacificMerchants. We’d love to see what’s inspiring you this spring (especially now that a seemingly endless winter is over)!